Headbands are always in fashion, and that's because there's a huge range to choose from High Street Brands 4 Less. Headbands work with anything: long hairstyles, short hairstyles, big wavy or curly hairstyles and straight hairstyles. 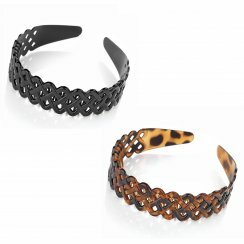 Get the best price on Hair Bands / Headbands at High Street Brands 4 Less. Free delivery is standard for all UK purchases and a maximum postage cost of £1 for our European Customers and £1.50 for orders shipped to the Rest of The World no matter how many items you buy.